Somewhere deep within our souls lies a longing for an adventure waiting to unfold. 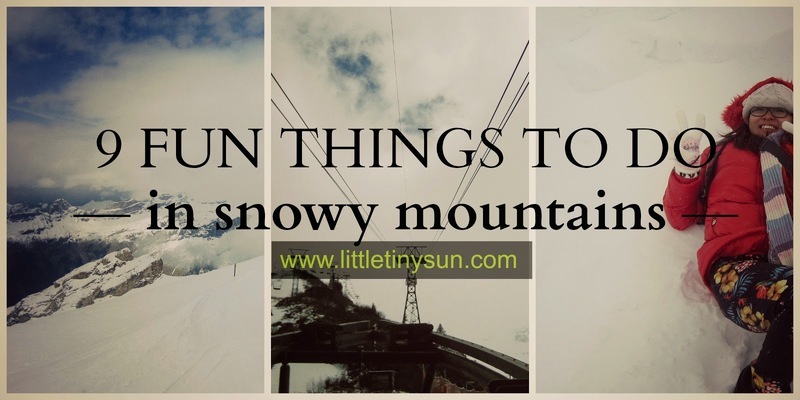 If you're making plans to visit a mountain, somewhere in Switzerland or any other mountains with snow, here are 5 things that you can do! Some of the tips here are only for the mountains in Switzerland, specifically Mount Titlis as the attractions and rides listed here are uniquely theirs. If you don't already know, Mount Titlis is 10000 feet above sea level. WOW! 1. Snap a photo of yourself at the foot of the mountain. Unless you live in the mountains or at the foot of it, how often can you take a shot with something so majestic? It's better than taking a picture with Lady Gaga or Justin Bieber. After all, generations will pass and fade out, but your mountain has been around since probably the beginning. 2. Snap a photo when you're on the way up the mountain. Even if there were two strangers beside you. Or even if the whole cabin is full of strangers. Strike a conversation with them, it is in this ride that you find very interesting people from very different culture. The ones that I was with were from Russia, and boy, they are... you'll know when you meet them. 3. Enjoy the ride up the mountain. DON'T be afraid of the cable car falling. According to Kristoff in the movie 'Frozen', he said that it would feel like falling on soft pillows. Of course it might not be true for your mountain, but you really should enjoy the ride up to the sky. I mean, how close can you be to the galaxy if you are not an astronaut? Truly it's a spectacular journey up the snow-topped mountains! 3. Don't make a snowman. Lay low, lie on the ground. Trying to have a snow fight would make your hands have a frost bite. In fact, if you dig your fingers in really hard, it's actually mud and you can get really dirty! Making a snowman would take a really long time too, unless you're an experienced snow-kid. 4. Take the Ice Flyer Ride on Mt Titlis. You'll regret if you don't. The Ice Flyer does not have any outer covering or 'seat belt', and you will be able to experience falling snow, blizzard, shivering cold, eating and breathing snow while you 'fly' over the mountain. Hang your feet in mid-air and enjoy the sights. It feels like flying without an aircraft. 5. Go cray cray on the mountain. No one knows you anyway. A group of Indian men took off their shirt, pants and shoes, standing naked (with their boxers on, thank God!) so as to snap a picture with the mountain view. It was really hilarious because they were shivering and chattering and everyone was laughing! But I don't remember them anyway, and I bet no one actually would unless such outrageous pictures are uploaded on their social media. 6. Explore the ice caves and leave your handprints on the ice glacier. I enjoyed the mysterious adventure inside the ice cave. It didn't felt spooky at all, but deadly romantic. I remember watching how Xiao Long Nu (小龙女: Little Dragon Girl) slept on a bed made of ice... this is where you can try and pretend to be like her. No one will know, haha! 7. Float on a cloud. When I was younger, I've always said "How I wish I could touch the cloud". Here on Mt Titlis, you literally stand inside the cloud. The feeling is ELECTRIC. Of course, it's a challenge to take a picture of yourself in the cloud, do bring a waterproof camera because the blizzard can suddenly hit you! 8. Have a meal on the mountain. Be very amazed at how there are actually people who live in the mountain. There was a restaurant in Mount Titlis and they sold very good food. Strangely, it was indian cuisine! 9. Get some ice off the mountain. The ice took really long to melt even though we reached the base of the mountain. Anyway, please don't drink from it. The ice may look really pure and clean, but it's actually really dirty! No amount of money can buy back great adventures and experiences. Visit Mount Titlis from USD$178.39 (prices depend on day and month of visit). Book your Mount Titlis day tour here now! The place is awesome and also your pictures are. Yeah, I am truly agree with all of your points to be enjoyed while on mountain travel. I want to travel on these places, thanks for providing these tips here. © 2015 littletinysun - All Rights Reserved. Powered by Blogger.